One of the handiest features of Socialcast is Groups. You can create or join unlimited numbers of groups, which makes it easy to create groups for team projects, to store specific types of files, to solve problems, or just to get to know each other. Step 1: Start a new group. 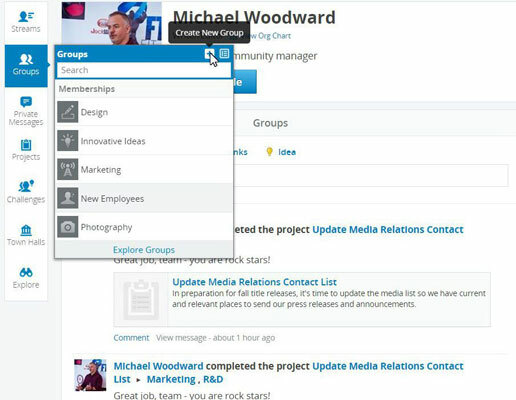 From anywhere in Socialcast, point to or tap the Groups icon on the main toolbar. If you hover there a moment, the Groups box appears. Here you can start a new group, search for an existing group, or view the whole list of current groups. Click on the + icon to start a new group. You want the group to be interesting and compelling for others to join, so give your group a title, a description, and maybe a photo. At the lower right is also a place to add popular or recommended links related to your group. 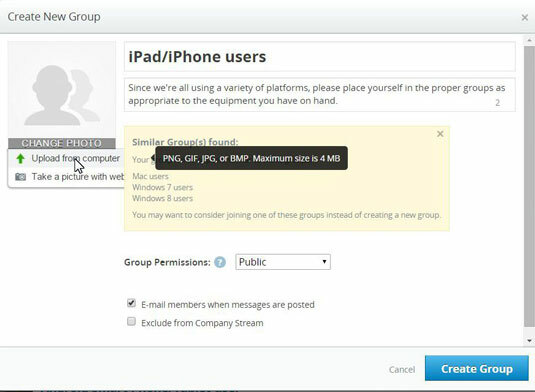 Group permissions enable you to control whether the group is open to anyone in the community, only to people you invite, or possibly even to people outside of the company (called externally facing). Group members will receive notifications whenever a message is posted, but you can also check the box to send them email about group activities. If you want to allow anyone to be able to join the group, check the Email members when messages are posted box. Step 3: Invite your coworkers and teammates to join. After you have the basics set up, invite the appropriate people to the party. You can type their names (if current community members) or email addresses. If you have many names, it’s easier to upload all the info in a spreadsheet with a CSV format. Step 4: Let the socializing begin. 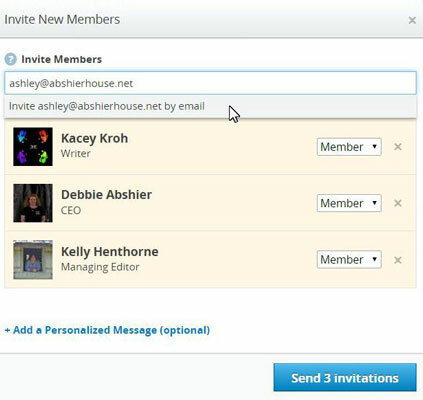 After you’ve sent out the invitations and people have begun to join, you can do a variety of things within the group. Most of them start by clicking on one of the options above the Status text box, depending on what you’re up to. How many times have you accidentally “replied to all” on an email when you only meant it to go to the sender? Same idea here. You can do most of these same activities from your Home page or the Company Home page in Socialcast, but you’ll be interacting with your whole community, not just those within the group. So be sure you’re barking up the right tree when you post! If you only want to see a certain type of group activity, click the down arrow next to All Activity to filter out everything except one type (files, links, photos, videos, broadcasts, or previously hidden activities). You can direct most posts to specific people or groups, and you can attach any kind of file to any kind of post including polls. If you choose. . .
link, you can choose which one to use for the preview. to help the group reach consensus on a question. sending a token of your esteem along with your glowing praise. feedback, including up and down votes. user’s Home stream for a set number of days. it to your hard drive. deadlines, and post related files. If a group is no longer active, you can archive it from the Settings menu. Archiving it will remove all of the group’s activities from everyone’s streams without permanently removing it from the community. After a group is archived, no new activities can happen unless the group is reactivated. Only after a group has been archived can you delete it completely from the community.